The 4th of July is nearly here, so it’s a great time to celebrate by doing whatever your heart desires! 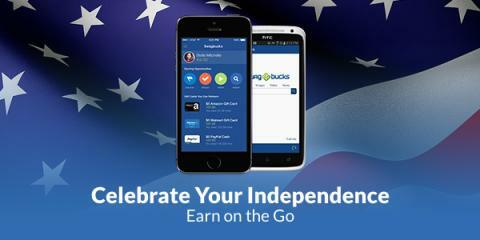 That’s why Swagbucks has announced the Celebrate Your Independence – Earn on the Go mobile promotion. Don’t have the Swagbucks mobile app yet? Download here. From now until the end of Sunday, July 6th, for every 10 SB you earn on mobile, you will gain an entry into a drawing to win one of ten 500 SB prizes! On Friday, July 4th for #MSBD, you’ll get 2 entries for every 10 SB you earn! What’s more: each day you get an entry for one of the 500 SB prizes, you’ll also get one free entry into the 88,888 SB Giveaway Swagstakes! (Limit 1 free Swagstakes entry per day of promo.) Sounds like Swagbucks likes to celebrate Independence Day by giving away a bunch of SB prizes! Important note: Daily Poll, Swag Codes, and Search wins from mobile don’t count towards the 10 SB required for an entry, but mobile offers, SBTV mobile, and earning SB via the EntertainNOW TV mobile app all do count! All mobile apps are available to US members for both iPhone & Android. Winners will be announced on Monday, July 7th, so enjoy the celebrations and earn as many SB as you can, wherever you are with the SB mobile apps!! Sign up here to get started, and good luck! ← Happy 4th of July – Swag Code Alert!